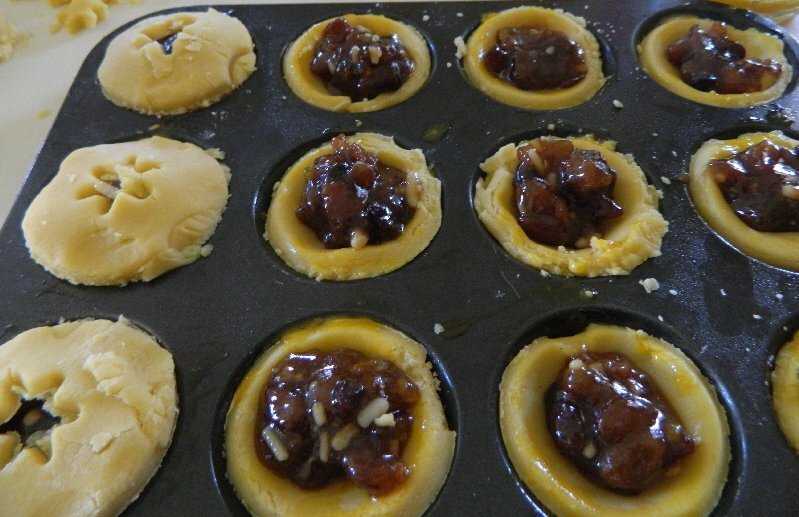 I thought that I would re-run this post again as it is my favourite recipe for mince pies. I am not a professional cook. It’s not even really a hobby. The main time of the year that I bake is at Christmas because I love all the traditional British Christmas goodies and I get more pleasure out of making them than buying them as it brings back pleasant memories of past Christmases that I’ve shared with my family. 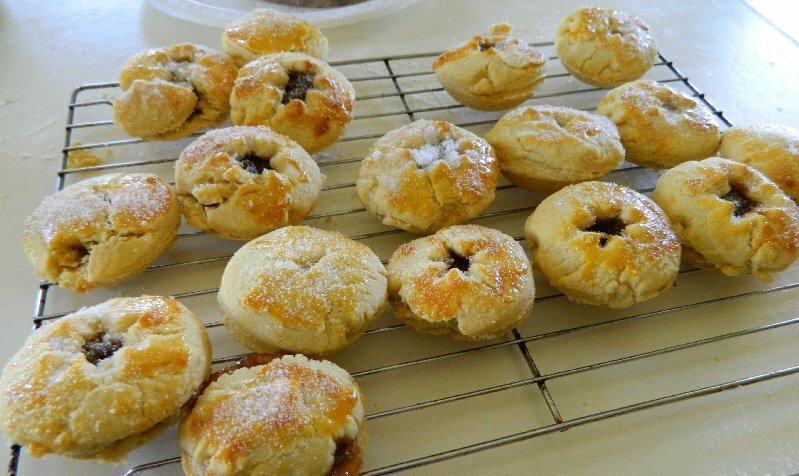 I love mince pies and look forward to having them every Christmas. The shops usually start selling them months before Christmas but I like to make my own. I do remember mum teaching me to make these when I was in my early teens and I took charge of making them for our family when I was about fifteen. I don’t think I have ever missed a year. I’ve experimented with various recipes. I used to make them with sweet short crust pastry but I’ve never been a very good pastry cook. When I was first married mum gave me the first Margaret Fulton Cookbook and in it was a recipe for mince pies made with biscuit pastry. I liked it so much I have been using it ever since. Every year my battered old book comes out and I make two dozen mince pies which is enough for Hubby and me and for my sister to have a batch as well. They can be frozen if you want to make them ahead of Christmas. 6 ounces (yes this is an old recipe) of butter. I sometimes use cooking margarine instead. 1/2 teaspoon baking powder To my horror when I came to make these this morning I found I had no baking powder so as hubby was unavailable to go to the shop I substituted bi-carbonate of soda. Baking powder is basically bi-carb (baking soda) with some other salts in it so it will work the same way. Sift flour with baking powder and stir into the mixture. 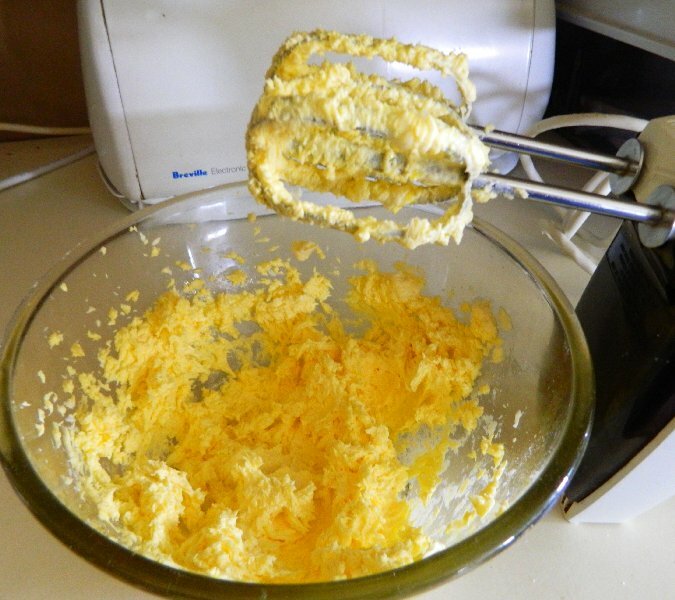 If you are lucky enough to have a food processor or mixer with a dough hook go ahead and use them. I don’t have either so I mix with my old Sunbeam hand mixer which I remember getting for my mum when I was about thirteen. There is a story to that but I’ll save it for another day. I mix the flour in with a knife and then with my fingers. This may be why I don’t make pastry too often. Still I’m better off than my grandmother. She did all her mixing with a wooden spoon or a fork. 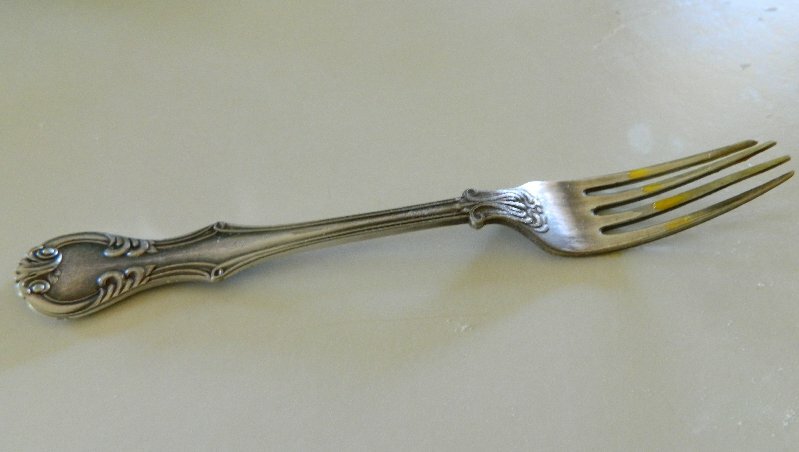 This Fork. 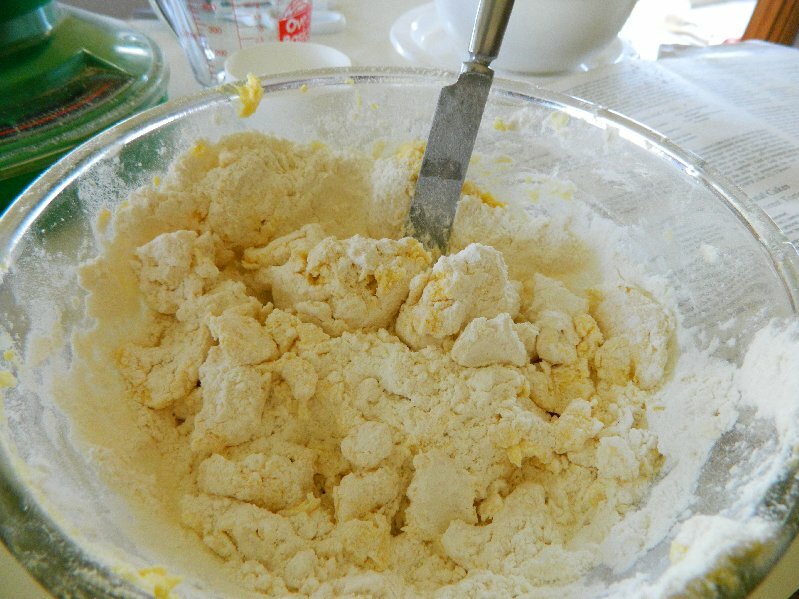 After mixing the pastry you knead it lightly on a floured board. At this point Margaret Fulton says chill the pastry for one hour but I have to admit I skip this step. I used to do it but I found the pastry even harder to handle chilled so now I just get on with it. I should mention that Margaret Fulton is an Australian and the recipes in the book are probably designed for Australian conditions so maybe if you are in a cool climate the chilling is not so essential. As I said, I’m not a chef. So chill or don’t chill as you please. 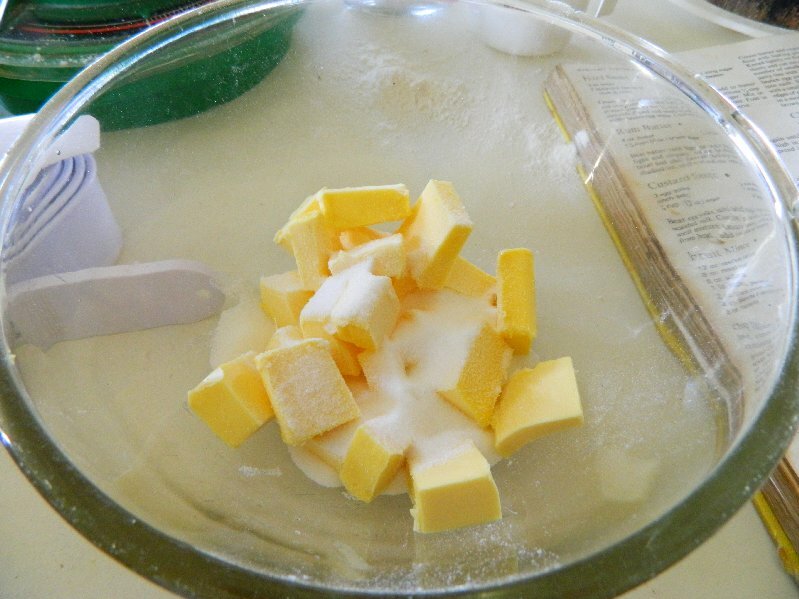 If my dough is crumbly I sometimes add a tablespoon of cold water to the mixture too. I didn’t today though. 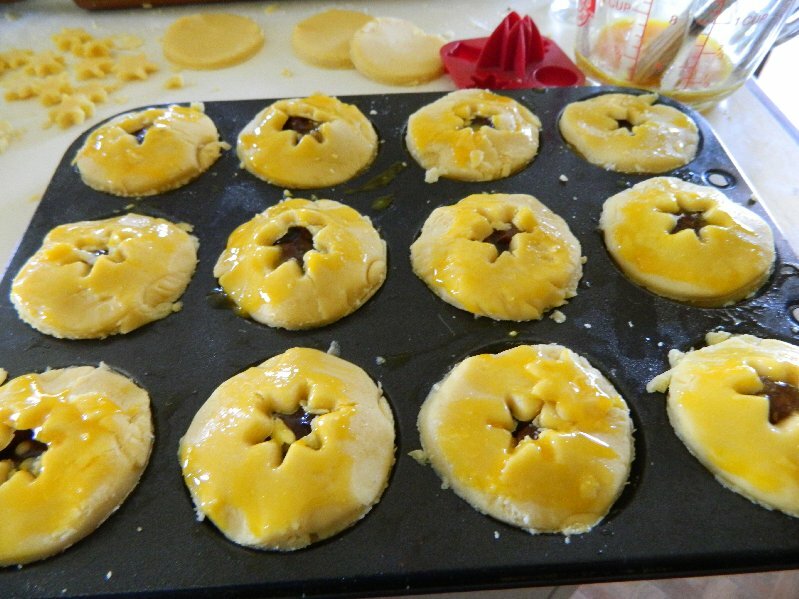 Roll out your pastry thinly and cut rounds to fit your patty pans. If you don’t have biscuit cutters a small glass is fine for this. Cut the same number of smaller circles for the tops. I digress from Margaret here and cut all mine the same size. 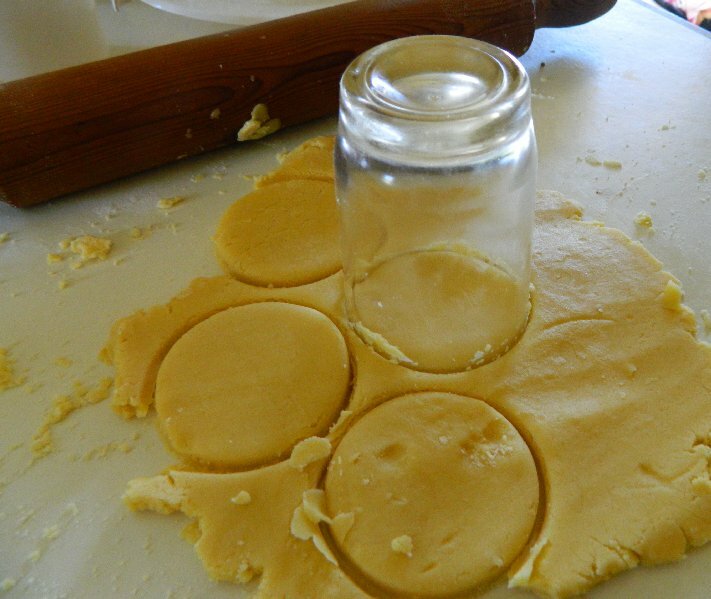 Place your larger rounds, or just half of them if you made them all the same size, in greased patty tins and moisten the edges with beaten egg. Fill each pie with 1 heaped teaspoon of fruit mince. 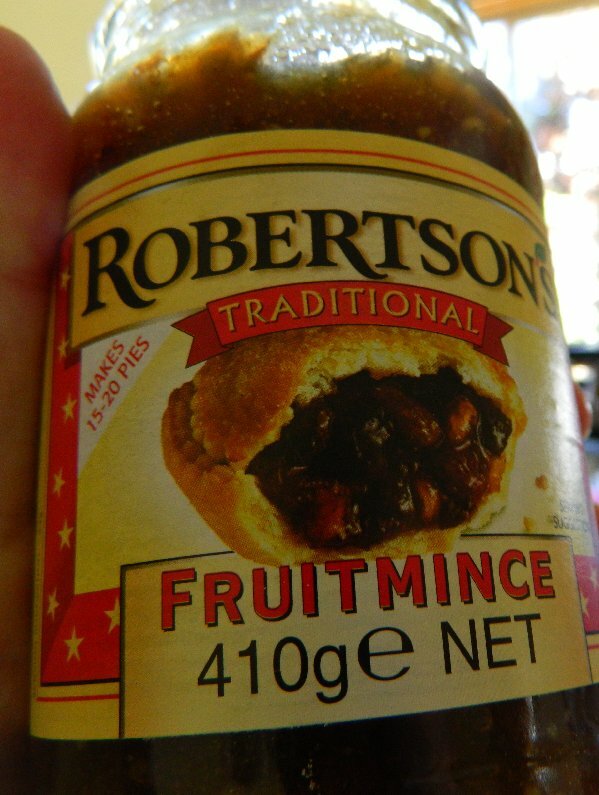 I like the English-made Robertson’s Fruit Mince best. I’ve tried other brands but you can’t beat this one in my opinion. One jar of it will make 15-20 pies, that’s what the jar says and it is true. Of course if you don’t like them really fruity it will go a lot further. Make a small slit in each pastry top or cut centre with a small star-shaped cutter and put into place on top of the fruit mince. Press edges together to seal the pastry. Cook in a moderate oven, 350 Fahrenheit. I do them at about 175 Celsius for 20-25 minutes or until pale golden brown. Remove from the oven and dust with icing sugar. Depending on how thinly you roll your pastry and the size of your patty tins you should get between 12-20 mince pies from this mixture. I tend to roll mine quite thick and I still usually get about 15. Don’t forget to make a wish when you eat your first one for the year. We did a lot of wishing on things in our family. I learned imperial weights and measures but mostly think in metric now. However my scales, also old, have both kinds on them. I hope they turn out well for you too. Thanks for reading my blog. 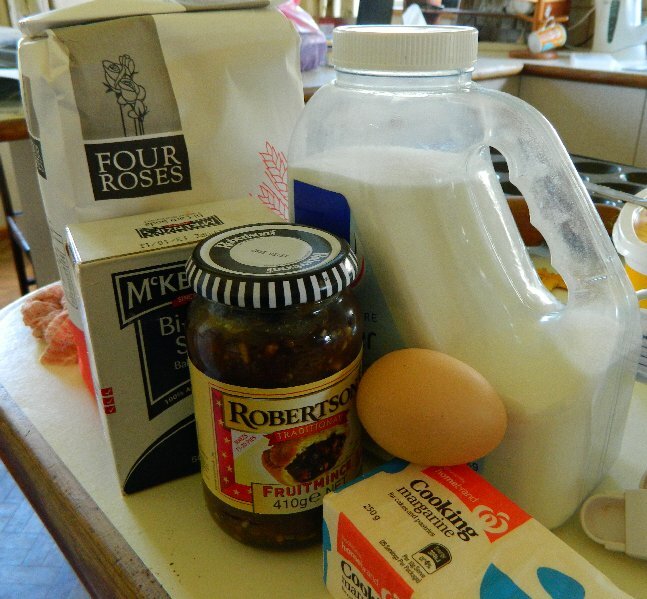 Lovely recipe with an Australian touch – Fruit Mince is still Mincemeat in England! I always called it that but it confuses some people.